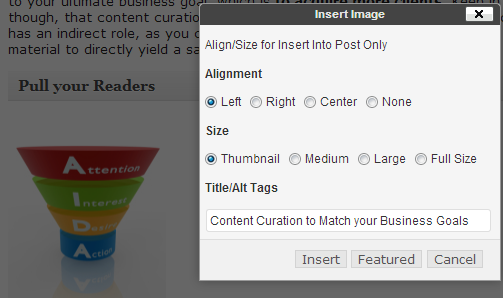 Content curation with MyCurator is completely integrated into your WordPress editor. All of the posts found by all of the Topics go to the same Training Posts page which is a separate menu item in your WordPress dashboard, usually located below the Comments menu item. All of the articles that meet your Keyword selection criteria for each Topic will be listed here. You can curate any article, no matter what its Relevance type of good, bad or not sure. As you hover the cursor over the title of each article a set of tags that show up. The [Make Live] tag moves the article to a regular WordPress Draft post and opens a new tab to let you edit it. The [Quick] tag allows you to make slight changes to the excerpt, add some notes and comments, and publish an article or save it to Draft. The [Multi] tag lets you curate several articles into 1 post – see the [Multi] Article Curation documentation for details. The trash can tag deletes an article from your Training Posts and moves it to the Trash. The [Notebk] tag lets you move an article to one of your Notebooks. See the Notebooks documentation for more details. If you have cleared the “Edit Post when Made Live” option, you will also see the [Make Draft] tag. If the Topic Status is set to “Auto Post Good – Active” then only articles of type not sure or bad will be in the Training pages for manual curation while all good articles will be automatically posted to the live blog. By default, when you click the [Make Live] tag on any post on the Training Posts page, you will be taken to the standard WordPress post editor in a new tab. If you would like to just move articles to a Draft Post without immediate editing, go to the Options menu item in the MyCurator menu in the Dashboard. Under the Manual Curation heading, look for the Option “Edit Post when Made Live” and clear it. A new [Make Draft] tag will appear to move articles to regular Draft Posts. The [Make Live] tag will now create a Published Post that will immediately appear on your blog. The [Quick] tag displays a pop-up window where you can change the title, the excerpt, add some notes/comments and then Publish or make a Draft of the article. Below the buttons is the complete readable page of the article as captured from the website. You can easily cut and paste new quotes or sections into the excerpt field before you post the article. Its also a quick way to review the article since you don’t have to open a new tab or window. The Note/Comment field will be placed as a paragraph in front of the Excerpt field. The format of the Excerpt field will be based on whether you have set the Format Option “Do Not Use Blockquotes on Excerpt”. The formatting of fields using the Quick popup is limited. The Notes and Excerpt fields can only be a single paragraph – line breaks, html and spacing will be stripped. If you need more formatting, post as a draft and use the WordPress editor to format the post before publishing. Once you are in the WordPress editor, you will find the article snippet and the attribution link are pre-loaded into the editor window. Below the editor window, look for a meta box named “Saved Page” (see screen clip below). It may be below other meta boxes depending on the types of plugins you have loaded. The Saved Page meta box contains the full article text as well as any images that could be extracted. At the top of the Meta Box is the title of the article as well as its attribution link. You can now review the article and use any of the text and images in your new curated post. When adding direct text from the article, it is best practice to use the Blockquote to highlight that this is from the original article. In the image below, you can see that when you roll your cursor through the Saved Page meta box, each paragraph, list and table will be highlighted in yellow. Just click while the element you want is highlighted and it will be immediately inserted into the post at the current cursor position. Make sure to position your cursor first, or even highlight a section of text in your post to be replaced, before clicking on highlighted text or images in the Saved Page meta box. Similarly, just click on an image and a dialog box will open up as shown below. If you choose Insert, the image will be inserted into the post at the current cursor position, with the alignment and size you’ve chosen. If you choose Featured, then the image will become the Featured Image for the post (alignment and size are ignored). In either case you can set the title/alt tag for SEO, with the post title as the default value. The click-copy feature is only available when in the Visual mode of the editor, it does not work when in text mode. You can also turn off the click-copy feature if you want to cut and paste smaller amounts of text than a full paragraph or if the highlighting doesn’t capture an element the way you would like. Just click the check box on the upper right of the saved page. 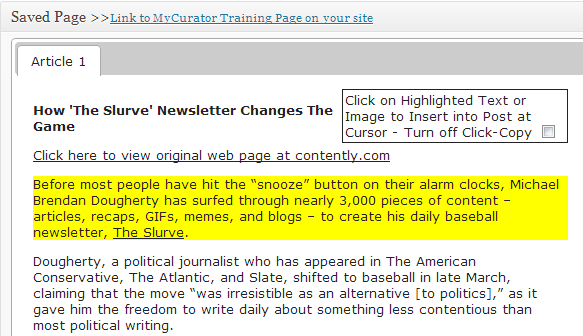 When MyCurator moves the Training post to the WordPress editor, it sets the post to Draft. You can continue to save the post as Draft until you are ready to post it live to your blog. Just click Publish and the post will be published to your live blog. You can still continue to edit the post and you will have the saved text and images available even after it is live.